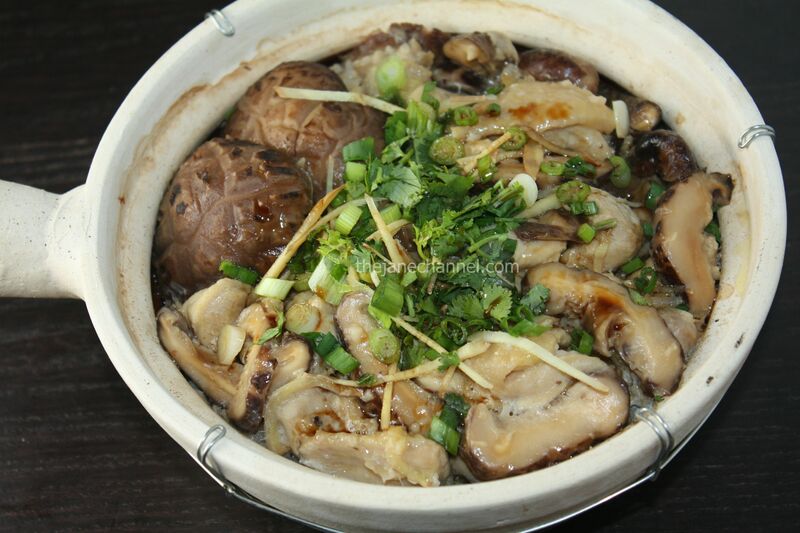 Claypot rice may be a winter indulgence, yet good food is enjoyable throughout the year. Claypot rice, or “rice in a little pot” translated literally from Cantonese Chinese, is a simple one pot dish that can be done in less than an hour. First, start cooking rice in a claypot. While it is cooking, toss in the marinated chicken and mushrooms on top, allowing them to cook and releasing the savory juices to the rice below. Allow the rice to absorb the flavors, and cook a bit longer until the the bottom turns slightly crispy. Lastly, top with fresh herbs – scallions, ginger, cilantro, and sweet soy sauce. Enjoy while it is still steaming hot – this is so good that it is worth turning on the A/C for. Marinate the chicken pieces with egg white and corn starch for 20 minutes in the fridge. The add soy sauce, 1/2 of the ginger strips, salt, sugar, wine, garlic, sesame oil and the mushrooms. Marinate for another 30 minutes or so. Thinly oil the inside of the claypot. (Apply oil to the pot before adding rice and water to avoid sticking and to make a crispy rice effect.) Heat over medium-high heat. Add the rice and water (including the water reserved from soaking the mushroom), and cover. Bring it to boil then add chicken, mushrooms and ginger strips. Cook over low heat for 20 minutes. Turn off the heat and cover for another 10 minutes or until chicken is cooked. Add scallions, cilantro, remaining ginger strips and drizzle sweet soy sauce mixture over the rice to serve. Looks so good! Thanks for sharing the recipe!